Preventing Crime vs. "Playing Tough on Crime Politics"
For decades, the primary response to crime has consisted of "tough on crime" sounding political slogans such as "three strikes and you're out" or "you do the adult crime, you do the adult time". As appealing as these policies may sound, the impact of codifying them ranges from a negligible reduction in crime to an actual increase in crime. As a result of this over-emphasis on so-called "tough on crime" approaches, the U.S. now has the highest average incarceration rate of any nation in the world, by far. And the "tough on crime" approach has not been cheap. Corrections costs in this country have risen from around $7 Billion a year in 1980 to over $68 Billion in recent years. The impact of this focus on incarceration falls disproportionately on minorities, particularly Blacks and Hispanics. For Black boys born in 2001 and since, the Sentencing Project estimates that one in every three will end up incarcerated in their lifetime without appropriate intervention, a trajectory the Children's Defense Fund (CDF) has described as a "cradle-to-prison pipeline." There is overwhelming evidence to show that children can move from a cradle to prison pipeline to a cradle to college and career pipeline. All the credible research shows that a continuum of comprehensive, evidenced-based prevention and intervention programs for youth at risk of, or involved in, delinquent behavior will greatly reduce crime and save much more than they cost when the avoided law enforcement and social welfare expenditures are considered. And the research reveals that these programs are most effective when provided in the context of a coordinated, collaborative local strategy involving law enforcement and other local public and private entities working with children identified as being at risk of involvement in the criminal justice system. Under the Youth PROMISE (Prison Reduction through Opportunities, Mentoring, Intervention, Support, and Education) Act, communities facing the greatest youth gang and crime challenges will be able to develop a comprehensive response to youth violence through a coordinated prevention and intervention response. Representatives from local law enforcement, the school system, court services, social services, health and mental health providers, the business community, and other public and private community and faith-based organizations will form a council to assess the problems and costs the community incurs as a result of youth violence, crime , and social welfare for teen pregnancy. The council will then develop a comprehensive plan for implementing evidence-based prevention and intervention strategies to address the problems and costs. The council will then ensure that the savings from implementing the programs are documented, so that some of the savings can be recaptured and applied to continue the program beyond the initial federal funding. Nothing in the Youth PROMISE Act eliminates any of the current "tough on crime" laws. While it is understood that law enforcement will still continue to enforce those laws where necessary, research tells us that no matter how tough we are on the people we prosecute today, nothing will change unless we prevent the next generation of potential offenders from following the same pattern. The Youth PROMISE Act has been proven to not only reduce crime but also to save much more money than it costs. An example of an "evidence-based" program under the Youth PROMISE Act is reflected by the State of Pennsylvania which implemented a process very similar to the one provided for in the Youth PROMISE Act in 100 communities across the state. The state found that it saved, on average, $5 for every $1 spent during the study period. An example of a "promising" program under the Youth PROMISE Act is the Richmond, Virginia Gang Reduction and Intervention Program (GRIP), a DOJ pilot program funded through a grant from the Office of Juvenile Justice and Delinquency Prevention. The program spent $2.5 million in a collaborative effort between the City of Richmond, federal, state and local partners focusing on a target community. In two years, major crimes in that target community were down 43% and homicides fell from 19 to 2. Cities that receive grants under the Youth PROMISE Act will be required to track governmental cost savings that accompany a drop in crime, and recapture a portion of those savings to keep the PROMISE programs alive after the federal grant period ends. In past Congresses, the Act has had broad, bipartisan support in both the House and Senate. There is also a coalition of over 250 national, state and local organizations that support the act. This coalition includes many cities and counties across the country that have passed resolutions in support, including Los Angeles, CA; Pasadena, CA; San Francisco, CA; Santa Fe County, NM; New York, NY; East Cleveland, OH; Pittsburgh, PA; Norfolk, VA; Newport News, VA; and Hampton, VA, and one state legislative body, the Vermont House of Representatives. In addition, the U.S. Conference of Mayors and the National Association of Counties have adopted resolutions urging Congress to pass the Youth PROMISE Act. We continue to work to build momentum for the Act and to encourage members of the 114th Congress to support this bipartisan legislation by becoming a co-sponsor. The Youth PROMISE Act represents a paradigm shift in the way we address juvenile crime policy in America. Instead of doing what is politically expedient, we have the opportunity to both reduce crime and save money. 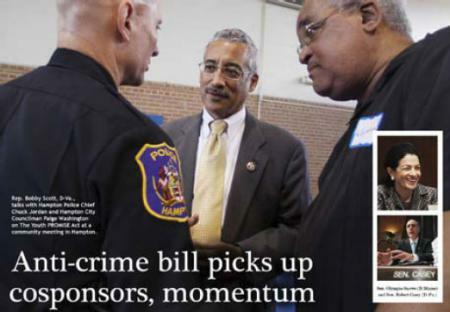 WASHINGTON, DC – Congressman Bobby Scott (VA-03), the top Democrat on the Committee on Education and the Workforce, issued the following statement after the passage of the Juvenile Justice Reform Act of 2018 (H.R.6964), which reauthorizes and reforms the Juvenile Justice and Delinquency Prevention Act (JJDPA) to help state and local leaders better serve juvenile offenders and at-risk youth. “Today is the culmination of a multi-year, bipartisan effort to improve our juvenile justice system. Rather than setting policy based in slogans and soundbites, the Juvenile Justice Reform Act is guided by the best-available evidence and the best interests of young offenders, at-risk youth, and communities across the country." Mr. SCOTT of Virginia. Mr. Speaker, I would like to thank the gentlewoman from North Carolina (Ms. Foxx) and the gentleman from Minnesota (Mr. Lewis) for working with this side of the aisle on bipartisan comprehensive reauthorization of the Juvenile Justice and Delinquency Prevention Act. 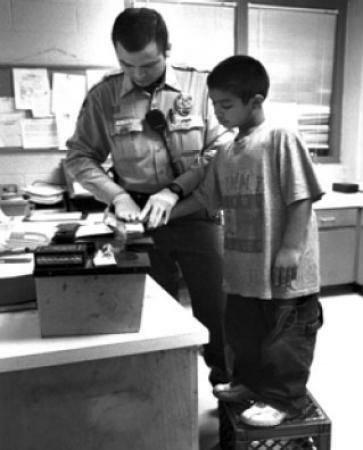 Juvenile courts were established by States in the first half of the 20th century based on the emerging legal theory that children should not be held as fully responsible for their actions as adults, a theory borne out over time by scientific research on impulse control and brain development. The opportunity to rehabilitate children became the focus of the system rather than punishment of offenders. Congress first articulated national standards for juvenile justice in the Juvenile Justice and Delinquency Prevention Act of 1974, or JJDPA. Long overdue for reauthorization, the bill creates important core protections for our children in the juvenile justice system in each State. WASHINGTON, D.C. – Today, the House of Representatives passed H.R. 5963, the Supporting Youth Opportunity and Preventing Delinquency Act. The legislation, sponsored by Representatives Bobby Scott (D-VA-03) and Carlos Curbelo (R-FL-26), reauthorizes for the first time since 2002 the Juvenile Justice and Delinquency Prevention Act (JJDPA) of 1974 to help states and local communities better serve at-risk youth and juvenile offenders. The legislation also includes language based on Congressman Scott’s Youth PROMISE Act (H.R. 2197) that restructures JJDPA’s Local Delinquency Prevention Grants to encourage communities to plan and implement evidence-based prevention and intervention programs specifically designed to reduce juvenile delinquency and gang involvement. Mr. SCOTT of Virginia. Mr. Speaker, I am honored to endorse the conference report on S. 1177, the Every Student Succeeds Act. We have certainly come a long way since we were on the floor debating H.R. 5, the Student Success Act, earlier this year. I had sincere objections to much that was found in H.R. 5, but thanks to the commitment to work together to try to fashion a decent bill with Chairman Kline and our counterparts in the Senate, Senator Alexander and Senator Murray, along with the many long nights from our respective staffs, we found a way to produce a conference report that balances the desire for more localized decisionmaking with the need for Federal oversight to ensure equity for underserved students. WASHINGTON, D.C. – Ranking Member Robert C. “Bobby” Scott (VA-03) today announced the introduction of H.R. 2728, the Youth Justice Act of 2015. The legislation would reauthorize the Juvenile Justice and Delinquency Prevention Act (JJDPA) of 1974, which has not been reauthorized by Congress in over a decade. The bill reinforces federal safeguards for state juvenile justice systems, by renewing education, safety, and prevention standards for our nation’s youth. The legislation is based on S. 2999, a bipartisan bill that was introduced on December 11, 2014 by Senators Sheldon Whitehouse (D-RI) and Chuck Grassley (R-IA). WASHINGTON, D.C. – Today Congressman Robert C. “Bobby” Scott (D-VA), Ranking Member of the Committee on Education and the Workforce, Congressman Walter Jones (R-NC), Congressman Trey Gowdy (R-SC) and Congressman Tony Cárdenas (D-CA) introduced the Youth Prison Reduction through Opportunities, Mentoring, Intervention, Support, and Education (“Youth PROMISE”) Act (H.R. 2197). The Youth PROMISE Act will provide resources to communities to engage in comprehensive, evidence-based prevention and intervention strategies to decrease violence, gang crime, illegal drug activity and other crime. Under the Youth PROMISE Act, communities facing the greatest youth gang and crime challenges will each form a local council of representatives from law enforcement, court services, schools, social service organizations, health and mental health providers, the business community, and other public and private community-based organizations, including faith-based organizations. The council will develop a comprehensive plan for implementing evidence-based prevention and intervention strategies for young people who are at-risk of becoming involved, or who are already involved, in gangs, or the criminal justice system to redirect them toward productive and law-abiding alternatives. The Hill Op-Ed: The cheapest way to reduce crime is to prevent it. Cites Youth PROMISE Act as path forward. In the United States today, we have a problem with our prisons. We incarcerate our people at nearly six times the rate of most other industrialized nations, and yet we have higher rates of crime. While our crime rate has dropped substantially over the past 20 years, crime and our high level of incarceration continue to have massive social and economic costs to our nation. According to the Pew Center on the States, state and federal spending on corrections has grown 400 percent over the past 20 years, from about $12 billion to about $60 billion. Corrections spending is currently among the fastest growing line items in state budgets, and 1 in 8 full-time state government employees works in corrections. Clearly we have a long way to go still, but there are methods we can use to make our communities safer while reducing incarceration, with its massive associated costs. NEWPORT NEWS, Va. (WAVY) – Congressman Bobby Scott put on held a forum for frustrated residents in Newport News Thursday night. The town hall meeting was about gang violence prevention. People packed An Achievable Dream Middle and High School to be a part of it. They wasted no time venting their frustrations to the audience and their representative, who was in town from Washington.